What is the difference between the EU and the eurozone? How did the PIIGS get so porky? 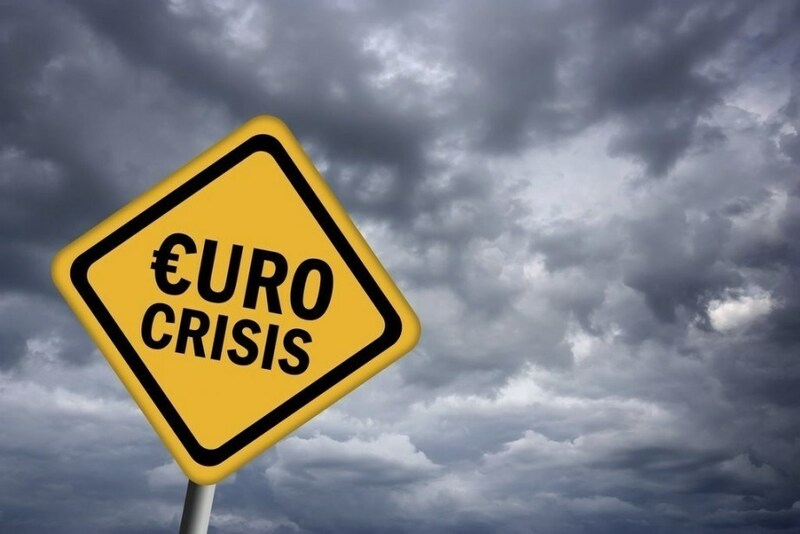 What happened during the European Debt Crisis? Why would Greece want to leave the eurozone? What does it mean to be downgraded? The eurozone is officially known as the “euro area”. It’s what is called a monetary union meaning that all the countries in the eurozone use the same currency – the euro. 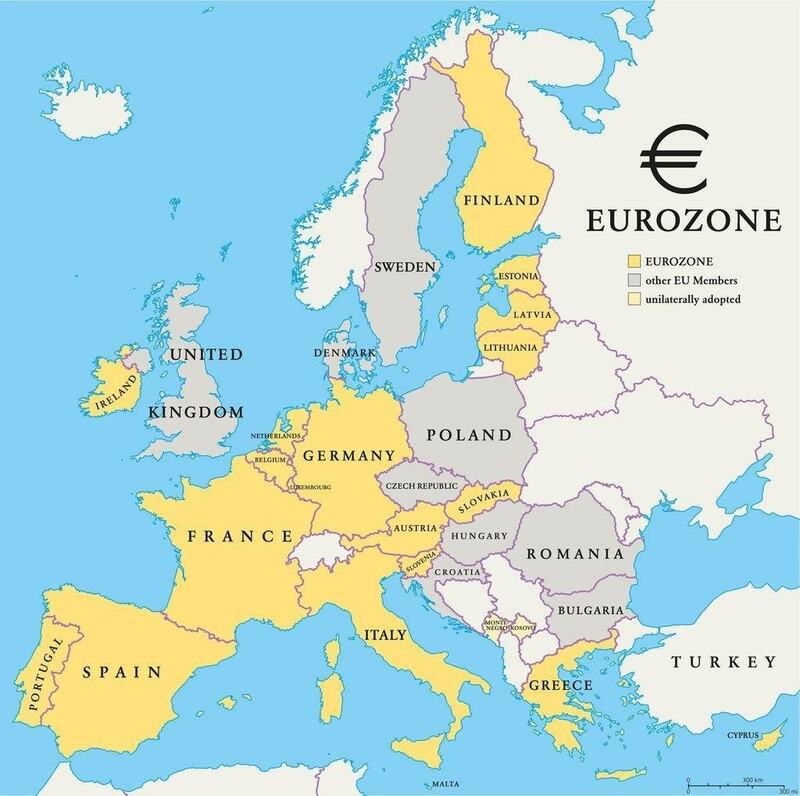 There are 19 countries in the eurozone: Austria, Belgium, Cyprus, Estonia, Finland, France, Germany, Greece, Ireland, Italy, Latvia, Lithuania, Luxembourg, Malta, the Netherlands, Portugal, Slovakia, Slovenia and Spain. Of the eurozone countries, Germany has the largest economy and so is often considered the most important member. EU stands for the European Union. The European Union has 28 member countries : Austria, Belgium, Bulgaria, Croatia, Cyprus, Czech Republic, Denmark, Estonia, Finland, France, Germany, Greece, Hungary, Ireland, Italy, Latvia, Lithuania, Luxembourg, Malta, Netherlands, Poland, Portugal, Romania, Slovakia, Slovenia, Spain, Sweden and the United Kingdom. Every country in the eurozone is in the EU but only 19 EU members are in the eurozone. The EU is a political union and the eurozone is a monetary union. Some EU members, like the UK and Denmark, have elected to keep their own currency (the pound and the krone respectively) rather than adopt the euro. The other member states are obligated to join the eurozone but have not yet met the economic criteria to do so. The EU is complex collection of overlapping institutions (learn more with the official EU website) but to understand the current situation you only really need to understand the European Commission and the European Central Bank. The European Commission is the executive body of the EU. It is made up of 28 members, each one from a different member country but sworn to represent the interests of the EU. There is one Commission President who is proposed by the European Council and Elected by the European Parliament. The Current President is Jean-Claude Juncker – previously the Prime Minister of Luxembourg. The European Commission is the only body in the EU that can propose laws. Other bodies (like the European Parliament) can block legislation but cannot initiate it. The Commission proposes legislation which then must be passed by both the European Parliament and the Council of Ministers. The Court of Justice then rules whether the legislation is permissible and the Court of Auditors must ensure that it meets budgetary restrictions. ECB stands for the European Central Bank. It is the European equivalent of the Bank of Canada or the US Federal Reserve. The ECB dictates monetary policy for the eurozone. Monetary policy is sometimes characterised as nothing more than printing money but it is a little bit more complicated than that. If there is more money in an economy then the price of goods and services will rise – this is inflation. Inflation is good in moderation because it means that the economy is growing. Too much inflation, however, devalues currency and makes goods and services expensive. Deflation is the opposite of inflation; it usually occurs when the economy ‘deflates’ – ie shrinks – and prices drop. Central banks try to maintain a “goldilocks economy” – not too hot, not too cold – not too much growth which leads to inflation but not too little which leads to stagnation or deflation. The ECB, like most central banks, has a few different ways of influencing their money supply. Like the Federal Reserve or the Bank of Canada, the ECB will adjust interest rates. When interest rates are low then money is cheaper to borrow so people will spend more. When interest rates are high people tend to save more money. So to encourage growth the ECB will cut interest rates and to slow inflation the ECB will increase interest rates. If lowering interest rates doesn’t boost the economy then central banks might implement something called QE. QE stands for quantitative easing. After lowering interest rates, quantitative easing is often the next step taken by central banks to heat-up a cooling economy. QE is as close to simply ‘printing money’ as most central banks get. It’s designed to further lower the interest rates offered by banks (remember even if the central banks interest rate is at or near 0% banks still have to make a profit so they will charge a higher interest rate on loans), and generate greater liquidity in order to stimulate the economy. When a central bank implements QE there are 4 main steps. A central bank starts to buy assets (usually government bonds) from banks and other financial institutions – replacing non-liquid assets with cash. Now financial institutions have more cash available to lend out and interest rates fall. Banks will also start to invest in other sectors of the economy since they don’t want to just sit on a pile of cash. Investors will use the new ‘cheap’ money available through low interest loans to start a business, buy a home, or spend in other ways. So QE injects cash into financial institutions, reduces interest rates, encourages investment and thereby stimulates the economy. Once the economy starts to grow the central bank can stop its QE program and even begin to raise interest rates to cool the economy if it starts to overheat. Britain and the US both used QE to jump-start their economies after the 2007 Financial Crisis. On January 22nd of this year the ECB announced a policy of “asset buying” – another name for QE – worth €60 billion per month until September 2016. Some worry that it is too little too late but the ECB is claiming that the policy has already helped boost the eurozone’s economy. Bonds are sometimes called fixed-income securities and can be issued by companies or governments. Really a bond is just debt or a loan. When you buy a government bond, say for $100, you are really lending the government $100. A bond is a promise that the government will pay you back. Bonds are usually safe investments but some riskier ones do exist. The amount of interest you make on bonds is usually tied to the risk and the length of the bond. You can also sell a bond, before the government pays you back, to someone else. When a central bank buys back government bonds it is really paying its bills early. But it also increases demand for bonds. When the demand for bonds is low the price rises(Governments offer better returns in order to encourage people to buy bonds). So when the government buys back bonds it is putting money into investors pockets but it is also lowering the price of bonds (which are safe assets) and encouraging people to invest in other things. This means that more people will invest in the stock market or make loans to small businesses and home buyers. This should kickstart the economy. Grexit is a silly sounding word with a very serious meaning – Greece leaving (or exiting) the eurozone. This is significant because no country has so far left the eurozone. In fact, the possibility of leaving the eurozone was considered so unlikely that it is not mentioned in any piece of EU legislation. If Greece did leave the eurozone then it would hurt the confidence that investors have in the euro and confidence is everything. Without confidence the value of any currency will fall. To find out how economic and political instability affect the value of currency click HERE. A Grexit would also hurt Greece. Right now investors will invest in Greek companies and Greek government bonds because they know (or think) that since Greece is part of the eurozone other stronger eurozone countries will bail it out if need be. PIIGS (also spelled PIGS) is a somewhat derogatory term used to characterise Portugal, Ireland, Italy, Greece and Spain. These eurozone countries have all incurred high levels of debt and suffered severe economic trouble. By joining the eurozone the PIIGS were able to borrow more than they would otherwise be able to since lenders knew (or assumed) that the other member states would bail them out if necessary. Think of it as the same as a co-signer on a lease or, more aptly, a credit card. No one wants to lend a teenager a lot of money (and that is what a credit card represents – the ability to take out short-term high-interest loans) but with a co-signer the credit card company has confidence that if the teenager doesn’t pay them back then at least the co-signer will. Having a co-signer allows the cardholder to borrow more money than they otherwise would be allowed, it might bump them up, for example, from a $500 limit to $2000. This is what happened during the lead up to the European Debt Crisis; the PIIGS borrowed a lot of money in order to pay for government spending. The ‘co-signer’ was the rest of the eurozone, particularly countries with strong economies like Germany. Greece (and the other PIIGS) could borrow more money because investors thought that other eurozone countries would be able and willing to bail them out. Why would Germany (or any other eurozone member) pay the PIIGS bills? The same reason a co-signer would pay their teenagers credit card bill – because it is their credit history on the line. If a co-signer doesn’t pay the bill then their credit score is hurt and no one will want to lend them money. If the eurozone doesn’t bail out a member country then no one will want to lend money to any country that uses the euro. Worse still, some of the biggest holders of Greek debt are other European countries (especially France) so if Greece (or other eurozone countries) fail to pay them back then other eurozone countries will have to add big losses to their already weak economies. Sticking with the credit card co-signer analogy: a teenager with a credit card racks up a bunch of debt and can’t pay their own bill. They then turn to their co-signer for help. In the lead up to the 2007 Financial Crisis the PIIGS were spending like crazy and why not? The economy was booming! Once the Financial Crisis hit (due to the housing bubble bursting in the US) then the global economy started to slow down and even shrink. Think about that teenager with the credit card: They just went out and bought an iPhone and some cool headphones, they can’t really afford it but that’s okay, they have a job. Then the 2007 Financial Crisis hits and they get fewer and fewer shifts until they’re laid off altogether – suddenly that small bill gets bigger and bigger. After the Financial Crisis it took another 2 years before the European Debt Crisis really grabbed the world’s attention in 2009. The slowing global economy meant that the debt-to-GDP ratio (basically how much debt a country owes compared to how much economic activity it creates) of eurozone members grew and grew. The credit card bill got bigger and bigger and income got smaller and smaller. Thankfully the ‘co-signers’ stepped up and bailed out the borrowers (especially Greece). But, along with the bailout came important stipulations. The borrowers would have to implement ‘austerity’. Austerity refers to the policies implemented by a government in order to shrink a deficit. These policies include slashing public spending and increasing taxes. Austerity is generally very unpopular because it almost always increases unemployment, decreases wages and cuts government services. In the short term austerity results in even greater hardships since the government is always the biggest spender in any economy. It’s like taking gross medicine to cure an illness, or some would argue, like a kick when you are already down. Officially Greece doesn’t want to leave the eurozone, but some Greeks do. Initially, the country took the bailout and accepted tough austerity measures. But the brunt of the cost of austerity was felt by everyday people. The irresponsible bankers and politicians who created the crisis got off scot free, meanwhile unemployment soared, jobs disappeared, government pensions were lost and poverty increased. In the years that have followed the first bailout and austerity, life has been hard in Greece. Because the government is always the biggest spender in an economy, cutting government spending means that economic activity slows. When economic activity slows the government collects less in taxes, so they then spend less and the economy slows more and so on and so forth. Austerity has led to 25% unemployment, 22% fall in GDP and a 35% increase in Greece’s debt to GDP ratio. It has been the Greek middle class that has been hardest hit. On January 25th of this year public opinion finally turned against the austerity government and an anti-austerity party, Syriza, was elected with 36% of the popular vote. Syriza believes that the terms of the bailout were too draconian. The party has vowed to renegotiate the bailout’s terms of repayment and to increase government spending. This has not gone over well with the troika and it now seems that Greece could be expelled from the eurozone for failing to meet its obligations – although this would be unprecedented and potentially dangerous for the eurozone. Some Greeks want Greece to leave the eurozone so that the country can dictate its own monetary policy instead of relying on the ECB. 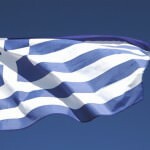 Alan Greenspan, the former Chairman of the US Federal Reserve has said that he fully expects Greece to leave the eurozone. The European Commission is the executive body of the EU and creates European laws. The European Central Bank governs the monetary policy of the eurozone. The IMF is, according to its website “an organization of 188 countries, working to foster global monetary cooperation, secure financial stability, facilitate international trade, promote high employment and sustainable economic growth, and reduce poverty around the world.” It does so by providing loans to countries in need to financial support. However the IMF will only provide these loans on the condition that certain policies are changed. The troika was responsible for providing Greece with the bailouts it has needed but also responsible for imposing the tough austerity measures that have become so unpopular. Tranche is French for ‘slice’ or ‘piece’. When referring to the current crisis in Greece a ‘tranche’ or ‘bailout tranche’ simply means part of a bailout. Rather than writing a blank cheque, the troika has been bailing out Greece bit by bit and only on the condition that austerity conditions are met incrementally. If Greece’s new government follows through on its commitment to end austerity then the troika could cease future tranches. Perhaps the biggest fear of the current crisis is that the PIIGS will fly. That is to say that if Greece leaves the eurozone the other PIIGS could follow suit. There are three main reasons for this fear; if Greece is expelled from the eurozone then the organisation might cut loose other struggling economies; if Greece leaves the eurozone voluntarily then anti-austerity political groups in the PIIGS might also leave in order to end austerity; if Greece leaves and defaults on its loans then the euro will tumble, and european holders of Greek debt will lose billions in assets causing a collapse of the eurozone economy. If the PIIGS do fly then this will mean that the economy backing the euro will lose huge country sized chunks of its GDP. Worse, it could signal the end of the euro. One of the biggest fears is that under the current government Greece will ‘default’ on its debt. A default is simply when a government (or any borrower) cannot pay back their debt. When a country defaults on its debt it will usually either restructure the debt or devalue its currency to make the debt more affordable. Eurozone countries cannot devalue their currency because only the ECB has power over monetary policy. Greece has been able to restructure some of its loans but the new government wants to go even further. The truth is however, that a sovereign (meaning government) debt is not like an individual’s debt. If you owe the bank money then they can just repossess your car, your house, your kids or anything else worth taking. If Greece owes you money you can’t just march in and repossess it – that is war – but you can decide to never lend Greece money again. You might also hear that a country has been downgraded. This means that a bond ratings agency like Moody’s or Standard and Poor (S&P) believes that the likelihood of a debt default is higher.